Reyna Grande vividly brings to life her tumultuous early years in this “compelling . . . unvarnished, resonant” (BookPage) story of a childhood spent torn between two parents and two countries. As her parents make the dangerous trek across the Mexican border to “El Otro Lado” (The Other Side) in pursuit of the American dream, Reyna and her siblings are forced into the already overburdened household of their stern grandmother. When their mother at last returns, Reyna prepares for her own journey to “El Otro Lado” to live with the man who has haunted her imagination for years, her long-absent father. Funny, heartbreaking, and lyrical, The Distance Between Us poignantly captures the confusion and contradictions of childhood, reminding us that the joys and sorrows we experience are imprinted on the heart forever, calling out to us of those places we first called home. Also available in Spanish as La distancia entre nosotros. Reyna Grande is an award-winning author, motivational speaker, and writing teacher. 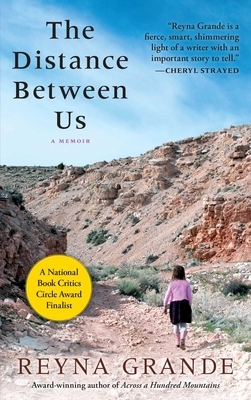 As a girl, she crossed the US–Mexico border to join her family in Los Angeles, a harrowing journey chronicled in The Distance Between Us, a National Book Critics Circle Award finalist that has been adopted as the common read selection by over twenty schools and colleges and fourteen cities across the country. Her other books include the novels Across a Hundred Mountains, winner of a 2007 American Book Award, and Dancing with Butterflies, and The Distance Between Us, Young Reader’s Version. She lives in Woodland, CA with her husband and two children. Visit ReynaGrande.com.